Y PPA Manager is a project I've been working on for a couple of weeks for easily managing and finding Launchpad PPAs in Ubuntu. Y PPA Manager is a tool for easily managing Launchpad PPAs that uses YAD for a graphical user interface (a Zenity fork which comes with a lot of improvements) and comes as a .deb and with a Launchpad PPA for easy updates. Please note that this is a pre-alpha release as I'm the only one who's ever used Y PPA Manager so far. Search in all Launchpad PPAs - will perform a search in all the Launchpad PPAs for the package you enter in the search form. The search uses the Launchpad PPA search so it may return empty PPAs if the PPAs have a description that matches your search, or a PPA with packages for a different Ubuntu version then your current Ubuntu version (or the Ubuntu version you've set Y PPA Manager to search for - see info regarding the settings below). You will be able to perform the following operations on a PPA: add it, list all the packages in that PPA for your Ubuntu version (or the Ubuntu version you've set Y PPA Manager to search for in the settings) - including the package versions, download selected packages from a PPA, copy PPA link (so you can then paste it in a web browser). Settings - there is no GUI option for this yet. But you can modify a few settings by editing the /etc/y-ppa-manager.conf file (you'll find info on the possible settings inside that file). 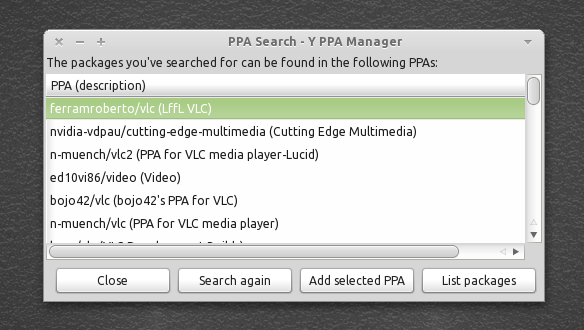 Options include: setting the Ubuntu version for the "Search all Launchpad PPAs" feature, setting the PPA-Purge behavior (automatic - the user will not be prompted; manual: a terminal window will open asking the user what to do from the available list of options in aptitude) and setting the PPA .deb download path. While most of the features are wrappers for some command line tools (Add PPA uses "add-apt-repository", Purge PPA uses "ppa-purge"), there is one feature you won't find in any other Desktop tool: the search feature. There is a search tool for Launchpad PPAs but it did not display the packages in the PPA it finds - Y PPA Manager on the other hand can display all the packages in a PPA that come up in the search results, along with their versions. You will then be able to add that PPA, download some .deb files from it or copy its link. It's nothing major but there wasn't a tool for performing all these operations in the same GUI, this being the reason why I'm launching Y PPA Manager. Y PPA Manager is of course not perfect since there are a lot of limitations to both bash and YAD, but I don't know any "real" programing languages. I've wrote it for my own use and to learn a few things but as usual I wanted to share it. Y PPA Manager only works with Launchpad PPAs (so it won't work for other 3rd party repositorties) and Ubuntu! Y PPA Manager should work on Ubuntu Karmic, Lucid, Maverick and Natty so there are packages available for all these Ubuntu versions. However, please note that I've only tested it on Ubuntu Lucid and Maverick (32 bit). Once installed, you can find Y PPA Manager under Applications > System Tools. The icons (which are actually .desktop files) in the main Y PPA Manager interface are not sorted properly. This is a very weird issue, either related to YAD or Ubuntu (so it's not a bug in Y PPA Manager) as the desktop files are properly sorted when running the script locally yet they seem to be displayed randomly when installing the .deb. If you know how to fix this, please let me know! This was fixed in the latest YAD. I haven't added progress bars to Y PPA Manager as I find them useless. If you have a decent Internet connection, they would only be displayed for a second so I really don't see the need for progress bars. However if this will be requested, I can implement it. There is a delay when adding a PPA on a computer which has the GPG key server port blocked. It eventually works but you'll have to wait a bit - this is not a bug in Y PPA Manager (you'll experience the same thing when using the "add-apt-repository command). Hopefully the Ubuntu GPG keyserver will change the port sometime to prevent such issues. Also, keep in mind that this is the very first release! Don't forget to report any bugs you may find @ Launchpad. Also if you have an idea / suggestion, let me know in the comments!